Co. Meath: Culmullen (2), Donaghmore (2), Dunboyne (3), Dunshaughlin (2), Kilbreu (2), Kilcloone (2), Killeen (2), Kilmessan (2), Rathfeigh (2), Ratoath (2), Skreen (2). The Board also included 8 ex-officio Guardians, making a total of 34. The population falling within the Union at the 1831 census had been 22,240 with Divisions ranging in size from Donaghmore (population 1,250) to Dunshaughlin itself (2,547). 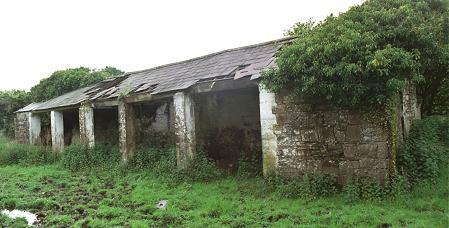 The new Dunshaughlin Union workhouse was erected in 1840-41 on a five-acre site 1.5 miles to the south of Dunshaughlin. Designed by the Poor Law Commissioners' architect George Wilkinson, the building was based on one of his standard plans to accommodate 400 inmates. Its construction cost £4,938 plus £912 for fittings etc. The building was declared fit for the reception of paupers on 12th May, 1841, and received its first admissions on 17th May. The workhouse location and layout are shown on the 1909 map below. 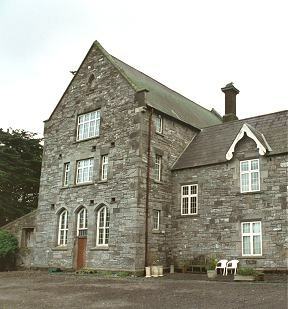 The workhouse had a two-storey entrance and administrative block facing to the road at the west. On the first floor was the board room where the Guardians met on Tuesday each week. 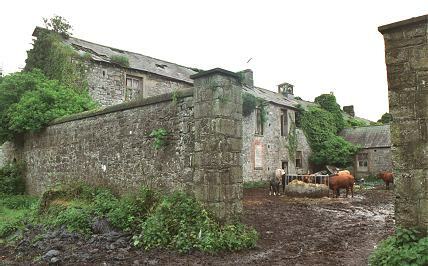 During the famine in the mid-1840s, stables and probationary wards were converted into sleeping apartments to accommodate an additional 71 inmates. Initially, 25 fever patients were treated in a house hired for use as a fever hospital, with the workhouse stables also fitted up for the reception of new patients. A fever hospital was subsequently erected to the north of the workhouse. A burial ground was located to the rear of the workhouse. In the late 1840s, the block was extended at its northern end with the addition of a three-storey wing containing children's accommodation and schoolrooms. To the rear of the administrative block stood the two-storey main accommodation block. 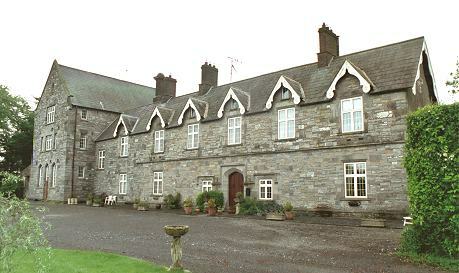 The accommodation block was linked to an infirmary at the rear by a central spine containing the dining-hall and chapel. A small ventilation tower in the centre of the infirmary improved the circulation of air through the building. 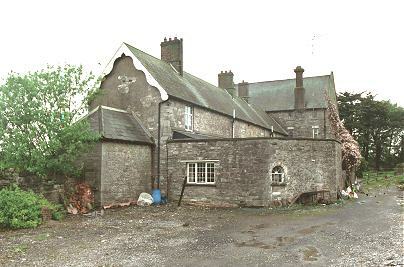 A single-storey block at the rear of the site may be the former workhouse stables. In the post-famine years, the workhouse rarely had more than a few dozen inmates. At the start of the First World War, the site was initially commandeered for military use. After being found unsuitable for accommodating soldiers, it was fitted up to house 125 Belgian refugees and thereafter became as a holding depot for refugees until they could be placed elsewhere. Some refugees died during their residence at the workhouse and were buried in the paupers' graveyard. In 1920-21, the building was taken over as a barracks by the 'Black and Tans' — a British reservist force — during the War of Independence. Following the creation of the Irish Free State in 1922, the workhouse system was abolished. The workhouse buildings subsequently had a variety of uses including a school, a courthouse and a factory. The entrance and administration block has now been refurbished for use as a guest-house. 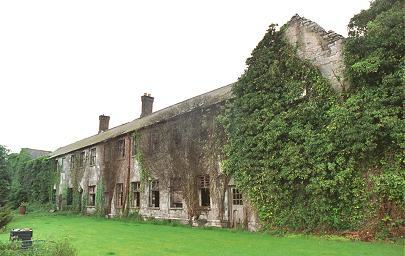 In 2002, the remainder of the buildings were derelict. Plans for their redevelopment have been the subject of much local debate. Meath County Library, Railway Street, Navan, Co. Meath. Holdings: Guardians' Minute Books (May 1839 - May 1843, Apr 1846 - Jan 1848, Dec 1848 - Feb 1850, Jan 1851 - Dec 1891, Jan 1893 - Nov 1921); Rough Minute Books (Jan 1856 - Dec 1857, Jan 1863 - Dec 1863); Miscellaneous statistics (c.1915-19, including daily return of inmates, Belgian refugees housed in Dunshaughlin workhouse, including arrival and departure dates).